I didn't personally buy very much this month, but I got a huuuuuuuge and amazing swap. Let's see it! Replace the Goosebumps with polish. Tinka, thank you for the amazing swap!!! I am still blown away! Essence Colour & Go - What Do U Think? Essence Colour & Go - Rock It, Baby! Essence Colour & Go - I Want That! Essence Colour & Go - It's Khaki Time! Essence Colour & Go - Glisten Up! Okay, that aside, I think I did pretty good! In total, that is a whopping 62 polishes. Yikes. But I only personally purchased 8 of those 62. Justified! July ain't lookin' so good. I did some shopping today... Haha! OMG I just laughed so damn hard at the Goosbumps photo. Made my night! LMFAO ermahgerd... I always feel so guilty for laughing at that poor girl, some of those memes are so mean lol. Anyways, those Essence polishes look great :] and 62 polishes...wow. kinda mean... but i just remember that this girl no longer looks like that and probably laughs at herself too!! HA! 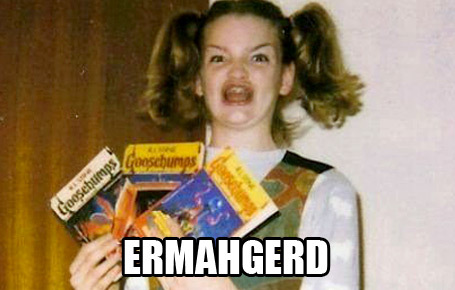 i can't google "ermahgerd" anymore... i always cry laughing! OMG DEAD at those Essence polishes. Soooooo jealous! I absolutely love Essence! You're so lucky to have Joe & Victory now!! I want them so bad!! :D The only old twin I have is Bonnie and I looooove it! Wow what a great swap! I had the same reaction to my swap with Tinka, lol! Love it!